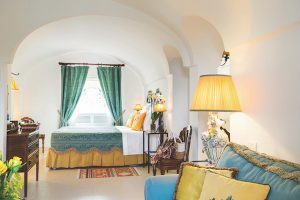 Opened in l996, this five-star luxury hotel dates back to the 15th century, when the Knights of Malta used the fortified farmhouse (Masseria) as a defence against Ottoman attacks. Effortlessly instagrammable, its dazzling white walls, piazzas and arched passageways create a tranquil village atmosphere. Situated in the Spa wing, my room features shuttered French windows leading to a private terrace. Other rooms and suites overlook the olive groves. The interior design is simple yet sumptuous with toiletries in the bathroom created from – yes, you’ve guessed it – olive oil. The spa’s central attraction is an indoor sea water swimming pool heated to 37-38 degrees centigrade. Drawn from a natural spring deep underground, the purified, mineral-rich water might not make for a refreshing swim but it will relax, revitalise and soothe aching muscles and joints. The Thalassotherapy Centre is accessed from the pool side. In a calming subterranean area displaying David Begbie mesh sculptures are further treatment rooms, a sauna, steam room, chromo-aromatic shower and gym facilities. 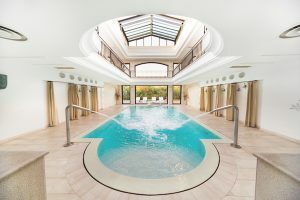 Whilst a dizzying selection of individual treatments for face and body are on offer, I opt for the two- to three-day Sculpt and Shape programme, which includes daily use of the Thalasso pool, Kniep routes, sauna, steam room and gym. Day One begins with a Biological Nutritional Consultation. Three white-coated doctors hook me up to a machine that, in under a minute, analyses my body composition and metabolism. It’s not great news. Results reveal dehydration, muscle loss, low bone minerals and that I’m prone to cramp – which is true! But there is hope. 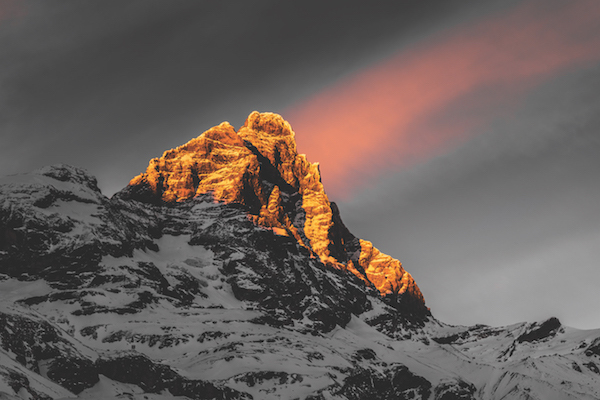 Drinking more water and following the Mediterranean diet – which, in my case, includes plenty of extra-virgin olive oil, anti-inflammatory produce such as brassicas, restricting meat eating to once a week and limiting cheese – will combat these issues. Another machine analyses stress and I’m given a breathing technique to practise for ten minutes every day. 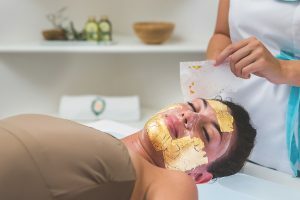 My first treatment, a mineral wrap, is conducted by chirpy thalassotherapist Antonella, who has worked at the Masseria for 14 years. Applying proteins, vitamins and minerals in a seaweed emulsion to my body and wrapping me in polythene like a human burrito, she leaves me simmering gently. Thirty minutes later, my perspiring, slimy body is immersed in a warm, soothing sea water whirlpool bath. My soporific reverie is interrupted by phase three, during which Antonella hoses down my wobbly bits with a forceful jet of warm water. A final cold water hose down is a shocking but invigorating finale to the course. The wobbly bits are also targeted during the Thalgo Sculpturing Oxygenating treatment. Beauty therapist Marion applies an oxygenated unguent before the ‘cupping’ therapy. 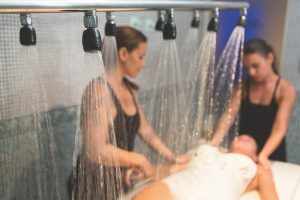 Said to aid relaxation and help with pain, inflammation and blood flow, this ancient form of alternative medicine uses suction to give a deep tissue massage. Halfway through, Marion asks me to feel my hips. Is there less of a curve on the side she has worked on? I can’t be sure, but my skin feels like chiffon. The second day kicks off with an energetic aqua gym session in the heated Hydro pool with personal trainer Fabio. Then it’s time for the surrealist Hydrocryotherapy – essentially a bicycle immersed in a shriek-inducing cold water bath. This apparently aids lymphatic drainage and water retention as well as speeding up cellulite reduction. It wasn’t an experience I was looking forward to, but after a hot gym session the cold water is refreshing and I cycle happily, while practising my new breathing techniques. Day Three starts with a French beauty brand Carita Techno-LED Remodelling treatment. Using a Carita device, Marion delivers micro current technology, including phototherapy and ultrasound, to tone and diminish skin problems. It sounds all very hi-tech and sci-fi but I can’t feel a thing except the paddle smoothing my skin. However, later, when putting on my swimsuit, I’m convinced my contours are a tad more streamlined. 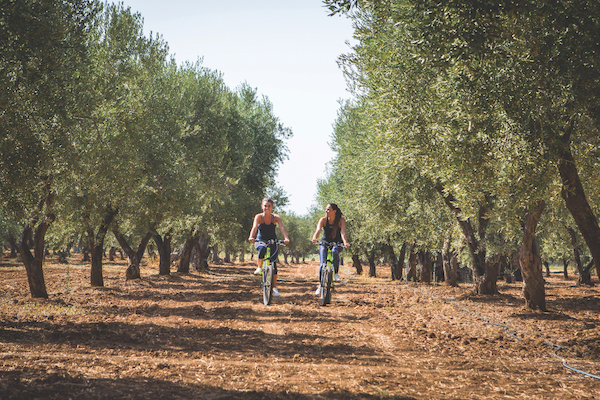 Later, a cycling tour with Fabio through olive groves and fields where broad beans, cabbage and fennel flourish alongside wild flowers, confirms just how energised, fit and firm I’m feeling. But it’s not all down to the treatments. On doctor’s orders, I’ve been hoovering up the delicious, imaginative and attractive dishes available on the full-board Mediterranean diet menu. Forget counting calories – this menu, created from simple ingredients, rich in vitamins, fibre and essential minerals, is designed to strengthen the immune system and delay the ageing process. According to Dr Grassi, a renowned nutritionist working in collaboration with the hotel, the Mediterranean diet does not offer quick fix weight loss but, as part of a daily routine, it will eliminate fat rather than water, thus maintaining an acquired weight for longer. So I haven’t starved and didn’t even have to give up pasta. But by the end of my delicious stay at the Masseria San Domenico, I’m less stressed and more in tune with my body. Bella figura here I come. 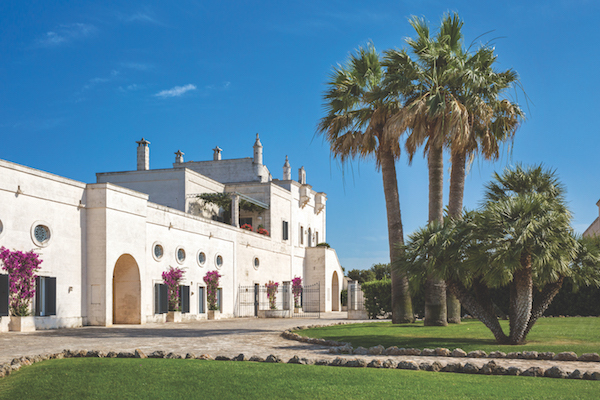 Masseria San Domenico reopens on 31st March 2019 and has rooms from €330 per night, based on two adults sharing a Deluxe Double room on a B&B basis, excluding VAT. The Sculpt & Shape Programme is available for €540 per person. A three-night stay is recommended. A Biologic Nutritional Consultation can be added to the package for €150 pp. Hydrocryotherapy Sessions can be added to the package for €70 per session pp. The full-board Mediterranean Diet Menu is available for €90 per day per person.